Eric Segerstrom appeared on Show 237, recorded in June 2011, at age 17. 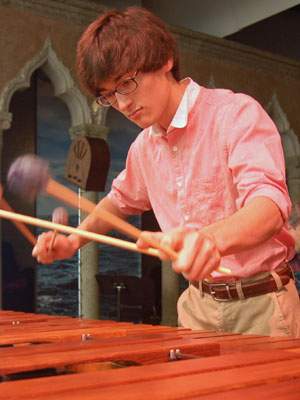 Eric Segerstrom (composer/marimba), age 17, lives in Delmar, New York and attends Bethlehem Central High School. He is a recipient of From the Top’s Jack Kent Cooke Young Artist Award. Eric studies percussion with Greg Giannascoli at the Juilliard Pre-College Division, and is a member of the Pre-College Orchestra. He also performs with the Bethlehem Central High School Symphony Orchestra, Wind Ensemble, and Jazz Band. Eric’s compositions were selected for the NYSSMA Young Composers Honors Concert in 2009 and 2010, and have been performed by the Juilliard Pre-College Percussion Ensemble and Empire State Youth Percussion Ensemble. Aside from music, he loves watching movies and being around his friends. Visit Eric’s YouTube channel to hear more of his music! Eric is a Jack Kent Cooke Young Artist.